Superior 4-stage multipurpose water filtration system for safer, healthier, better-tasting water. The unique 4-stage design, which includes both UltraFiltration and KDF/GAC stages provides the most effective water filtration in its class. 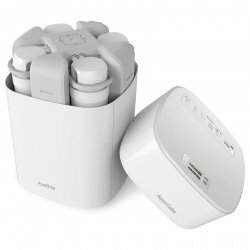 The superior 4-stage multipurpose water filtration system with its 0.01 micron Ultra Filtration (UF) stage removes up to 99% of most problematic pollutants, including chlorine and chlorine treatment by-products, bacteria, giardia, lead, arsenic, and much more while retaining healthy minerals. The Click on /off filter design means changing filters couldn’t be easier. No tank is needed with the system which means no wasted space. The CUW4 is flexible, quiet and durable. The integrated design has no moving parts and is very easy to maintain. Stay informed on your filter’s status with the integrated LED filter change indicator. Just press and hold both buttons to start. 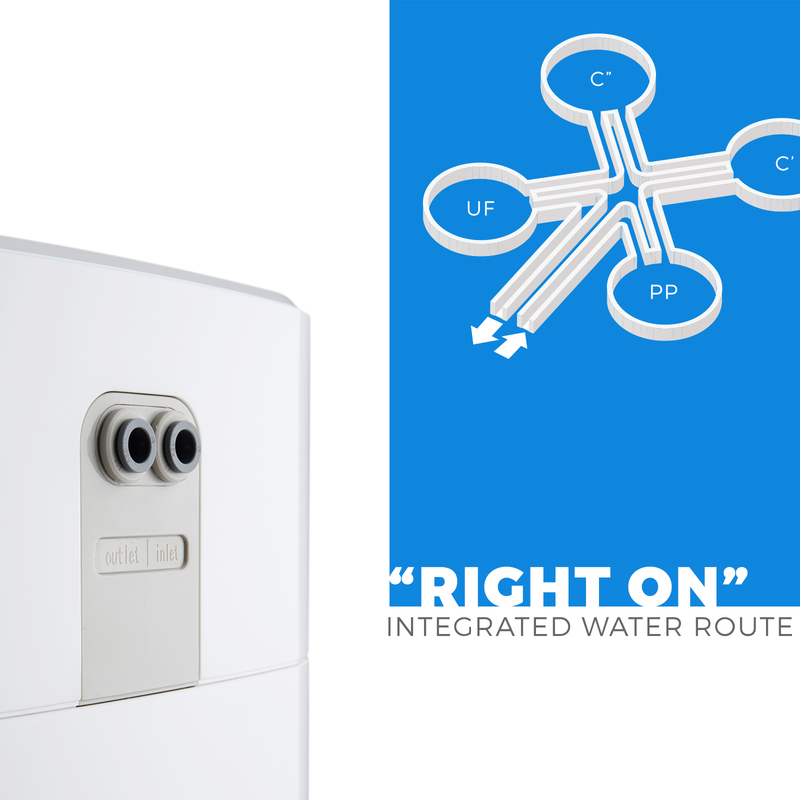 The CUW4 is simpler and more compact than traditional reverse osmosis systems. It’s best used for filtering and purifying municipal water supplies. The advanced 4-stage design of the CUW4 features a unique combination of sediment, activated carbon, and ultra-filtration filters. It eliminates a wide variety of unhealthy contaminants, including bacteria, algae, fungi, giardia, lead, arsenic, iron, nickel, chromium, cadmium, calcium, aluminum, mercury, chlorine and chlorine treatment by-products, pesticides, hydrogen sulfide, and other organic compounds. You experience safer, healthier, and better-tasting water without the hassle, expense, and negative environmental impact of bottled water. The CUW4 is flexible, quiet, and durable. The integrated design has no moving parts and is very easy to maintain. Our high-capacity, high-performance filters last longer and provide maximum water flow – a difference you’ll notice when you turn on the faucet. The Click on/off filter design means changing filters couldn’t be easier. No tank is needed with the system which means no wasted space. The system includes a lead-free faucet with beautiful chrome finish which is usually mounted on the counter as the primary source of drinking water. The CUW4 also easily adapts to fit nearly any refrigerator or ice maker connection. The CUW4 has been designed from the ground up to be easy for most users to install themselves, using readily available tools. The pre-assembled system includes push-to-connect fittings that simplify the installation process and minimize the possibility of leaks. A clear and well-organized instruction manual guides you step-by-step through the entire installation and testing process. If you do run into an issue or get stuck, our technical support team is ready to assist you, Monday through Friday between the hours of 9 am to 5 pm Eastern time. The whole system is backed by a 1-year manufacturer warranty and lifetime technical support provided right here in the USA in Atlanta, Georgia. If you have a need to reduce overall dissolved solids in the water (reduce TDS) or to remove heavy concentrations of harmful metals like lead or copper, a reverse osmosis system like the PureDrop RTW5 is recommended. But for all-around high-performance water filtration, or where space is at a premium, the CUW4 is the best, most economical and flexible choice for clean, fresh, great-tasting water instantly. <li>Cut hassles, not corners with a typical installation time of less than 30 minutes. 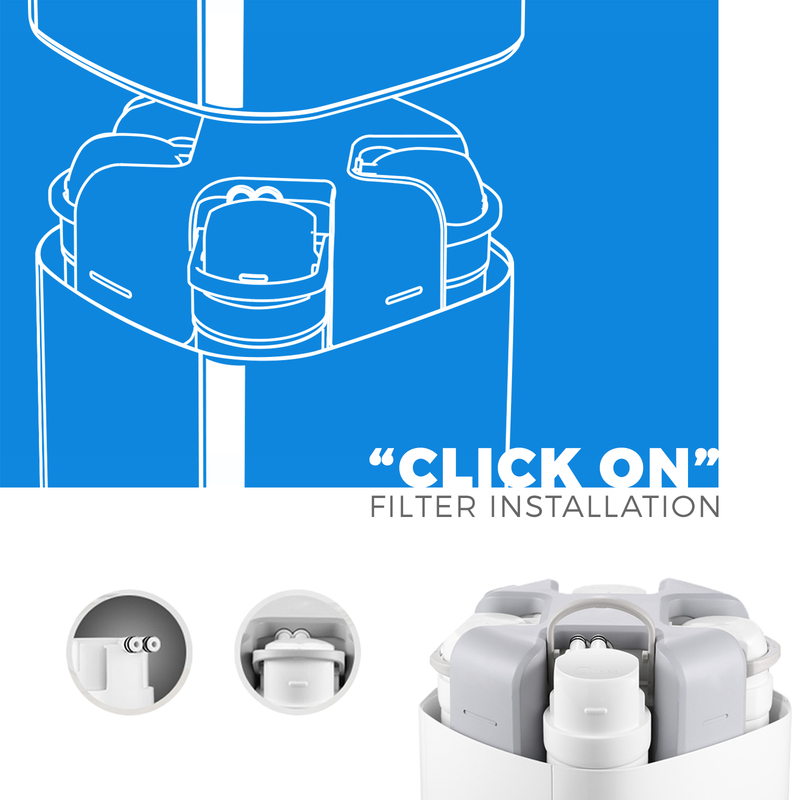 The unique design of the integrated water route reduces installation time dramatically, and the click-on filter installation ensures easy installation and maintenance. <li>Enjoy safer, healthier, better-tasting water. The superior 4-stage multipurpose water filtration system with its 0.01 micron Ultra Filtration (UF) stage removes up to 99% of most problematic pollutants, including chlorine and chlorine treatment by-products, bacteria, giardia, lead, arsenic, and much more while retaining healthy minerals. 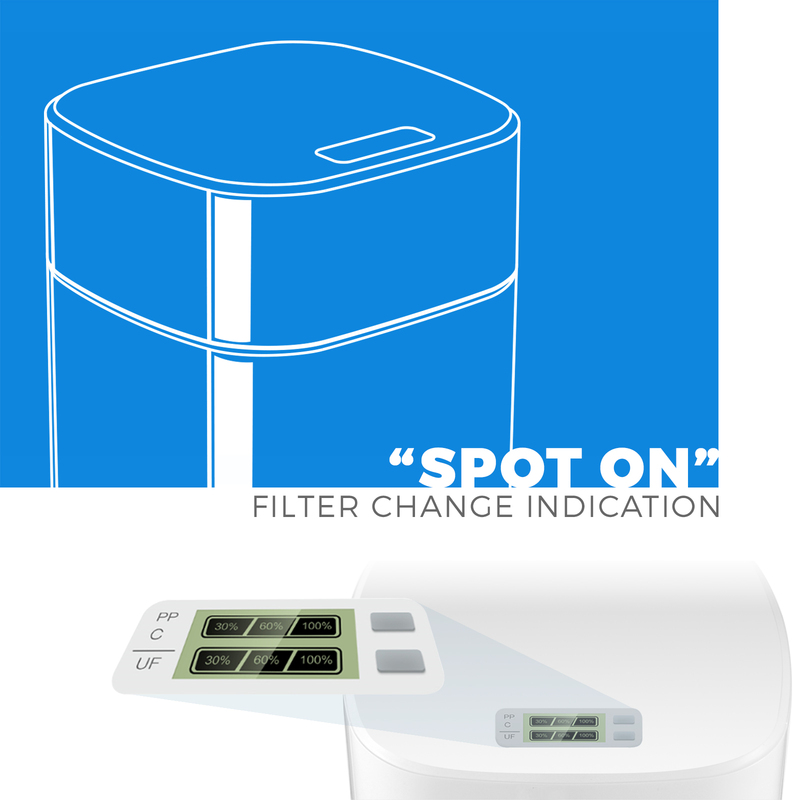 <li>Stay informed on your filter’s status with the integrated LED filter change indicator. Just press and hold both buttons to start <li>Save space under the counter. The elegant, compact design needs no tank, wastes no water, and provides ultra-quiet operation. <li>Enjoy a faster water flow (0.32-0.5 GPM vs 0.03 GPM with traditional reverse osmosis systems). The unit can be placed under the sink or connected to your refrigerator or coffee maker. <li>Expect the highest standards of safety and water quality. All filters, tubing and other water-contacting parts are manufactured to comply strictly with FDA and NSF/ANSI standards. <li>Look to a dedicated support team based in in Atlanta, GA and available at 678-900-4702 to provide lifetime technical support. The CU-A4 effectively removes most problematic contaminants while maintaining a natural alkaline balance and great taste. Designed and crafted in USA, iSpring is America's favorite brand of water filtration systems. All of our systems go through rigorous testing for air leaks, pressure and cycle resistance to adhere to our own demanding quality and high-performance standards. You are assured of many years of safe, trouble-free, low maintenance peace of mind. Stage Two: The UF stage holds the Ultrafiltration (UF) hollow fiber membrane. Capable of removing emerging contaminants like waterborne bacteria and waterborne protozoan parasites. These emerging contaminants can be pharmaceuticals or chemicals not yet regulated by the EPA. Stage Three: The third stage is a hybrid Kinetic Degradation Fluxion (KDF) Media and activated charcoal (GAC) filter. The KDF media sets the CU-A4 apart from other systems by providing much better control of particularly problematic contaminants including bacteria, algae, fungi, chlorine, pesticides, hydrogen sulfide, iron, lead, nickel, chromium, cadmium, calcium, aluminum, mercury, arsenic, and other organic compounds. Stage Four: The last fine activated carbon (GAC) filter provides final polishing before the purified water is delivered to the faucet, removing any possible residual chlorine, tastes or odors. The CU-A4 is designed to be simple to install and simple to maintain. Push to connect fittings and color-coded tubing simplify the installation process. iSpring Twist On / Twist Off filter cartridges make changing filters a snap. The Ultra Filtration (UF) stage contains hollow fiber membrane technology with a pore size of just 0.1 micron, surpassing the performance of both carbon block and “portable mini” water filters. The CU-A4 is the only filter in its class to offer Kinetic Degradation Fluxion (KDF) Media which adds an important additional layer of protection to control microorganisms and metals. Simple, compact and flexible, the CU-A4 provides highly effective water filtration for any number of clean-water needs - at the sink, in the refrigerator, for coffee makers and more. With no storage water tank and no waste water, the CU-A4 is perfect even for RVs. The iSpring #CU-A4 Ultrafiltration Water Filtration System utilizes State-of-the-art UF Hollow Fiber Technology, which removes 7 log (99.99999%) of all bacteria and 6 log (99.9999%) of all protozoa. Its certified 0.1 micron (comparing to 0.2 micron in Watts UF3) absolute filter removes bacteria and protozoa at a higher rate than accepted EPA guidelines. Google "CDC Ultrafiltration" and find that Ultrafiltration is "very high effectiveness in removing protozoa (for example, Cryptosporidium, Giardia) and bacteria (for example, Campylobacter, Salmonella, Shigella, E. coli) and moderate (mainly because CDC defines UF as pore size ranges vary by filter from 0.001 micron to 0.05 micron) effectiveness in removing viruses (for example, Enteric, Hepatitis A, Norovirus, Rotavirus)". It is estimated that VOCs (volatile organic chemicals) are present in one-fifth of the nation's water supplies. These contaminants can enter ground water from a variety of sources, including herbicide and pesticide runoff, gasoline or oil spills, leaking underground fuel tanks, disinfection byproducts, septic system cleaners, and chemicals used in the dry cleaning industry. The CU-A4 keeps you safe from these and other VOCs with its 4-stage filtration. Because it doesn't produce waster water and requires low water pressure, it can be used anywhere, such as the back of refrigerator or in an Recreational Vehicle so you can enjoy cleaner, healthier drinking water wherever you are. Featuring a patent pending space-saving design that is perfect for both house and RV, this Ultrafiltration water filter can be installed in a matter of minutes. The package comes with one filter set that can filter up to 10,000 gallons or 6 months, whichever comes first. 2nd Stage: State-of-the-art UF Hollow Fiber membrane uses standard home water pressure to push water through a semi-permeable membrane. Suspended particles and materials of high molecular weight, such as bacteria, are unable to pass through the 0.1 micron UF membrane, leaving you with only fresh clean water and dissolved minerals. 3rd Stage: KDF media (or Kinetic Degradation Fluxion Media) with activated carbon. KDF itself is known to kill algae and fungi, control bacteria growth, and remove chlorine, pesticides, organic matter, rust, unpleasant taste and odour, hydrogen sulfide, iron, lead, nickel, chromium, cadmium, calcium, aluminium, mercury, arsenic, and other organic compounds. When used with carbon, KDF can extend carbon filter life for up to 8 times. It also adds a healthy dose of zinc ions to the filter water. 4th Stage: Post Activated Carbon Filter adopting fine coconut shell activated carbon with ultra-micron aperture, this carbon filter absorbs residual chlorine, organics, humus, and odor. Unique swivel-valve, push-button assembly that allows for easy installation. CU-A4 module (complete with 4 filter cartridges), Drinking Water Faucet, 3/8 inches Feed Water Adapter, 15 feet of 1/4 inches tubing, and manual. Note: the performance data was from 3-stage CU-A3. CU-A4 is its upgraded model with additional KDF+CARBON stage that can remove 98% of lead, mercury, copper, nickel, chromium, and other dissolved metals. It can also reduce iron and Hydrogen sulfide. Step 1: Mount the Feed Water Adapter to Cold Water Supply Valve under sink. Make sure O-rings are in place and no need to over tighten. Step 2: Install the drinking faucet. A 1-1/4 (1.25) inch hole on the counter is needed. Faucet stem is 3 inches long. If your countertop is thicker than 3 inches, please get a Faucet Stem Extender. Step 3: Remove plastic film wrap, twist the filter cartriges on. Insert the tubing from Feed Water Adapter in step 1 to the water inlet next to 1st stage on the right side. Insert the tubing from drinking faucet in step 2 to the water outlet next to 4th stage on the left side. Step 4: CU-A4 can stand by itself or be hung on the cabinet wall with two screws. While full of water, it weights about 7 lbs. <li>Superior 4-stage multipurpose water filtration system for safer, healthier, better-tasting water. The unique 4-stage design, which includes both UltraFiltration and KDF/GAC stages provides the most effective water filtration in its class. <li>The 0.1 micron Ultra Filtration (UF) stage removes up to 99% of most problematic pollutants such as chlorine and chlorine treatment by-products, bacteria, giardia, lead, arsenic, and much more, while retaining healthy minerals. <li>Simple, compact and flexible, the CU-A4 provides highly effective water filtration for any number of clean-water needs - at the sink, in the refrigerator, for coffee makers and more. With no storage water tank and no waste water, the CU-A4 is perfect even for RVs. <li>Designed for high reliability, maximum flow rate and low maintenance, the CU-A4 uses High capacity cartridges that last up to twice as long as similar products. Can be installed inline and used as a fridge filter <li>All filters, tubing and other water-contacting parts are manufactured to comply strictly with FDA and NSF/ANSI standards for safety and water quality. Simple to install and simple to maintain, CU-A4 Easy-Twist Cartridges simply twist on and off. <li>iSpring supports all of its product with the best support in the industry. In addition to our 1-year limited warranty, we offer lifetime technical support provided by our dedicated, WQA-certified support team based in in Alpharetta, GA and available at (678) 261-7611.